The quote that frames the “Deeper Learning” chapter can serve as educators’ guidepost for inquiry, traditional literacies, and digital literacy as well. Right Question Institute leaders Dan Rothstein, Luz Santana, and Andrews P Minigan proclaim: “Having students create their own questions is a short-cut to deeper learning” (2015, 71). I agree… and I also agree with these authors that students need guides to help them dig deep to find their most personally meaningful questions that will motivate them to pursue answers, even when the going gets rough. For far too long, many K-12 students have experienced school as the place where educators ask the questions and students supply the answers (answers that educators already know). While this paradigm has been changing, factors that can set up barriers, such as an over-emphasis on standardized tests or students’ grade point averages, have been impeded change in many school environments. Linda F. Nathan who wrote a book called The Hardest Questions Aren’t on the Test: Lessons from an Innovative Urban School and contributed to the “Principals Know: School Librarians Are the Heart of the School” video, wrote this deceptively simple statement in a recent Educational Leadership article: “Problems can have more than one solution and questions can have more than one answer” (Nathan 2018-2019, 62). For many students (and educators) that fact can be a welcome (or disconcerting) surprise. Student-led inquiry, fine arts projects, science experiments for which the outcome is truly unknown, various projects involving real-world data collection—these are some types of opportunities educators can design and guide in which students can experience more than one solution to self-generated questions—where they can experience deeper learning. The “senior research project” has long been a staple of the high school curriculum. The goal of this project is to integrate skills (such as communication, collaboration, creativity, and critical thinking), academic concepts from multiple disciplines, and data from the students’ courses into one summative project. In most cases, these projects are individual. Students may be “assigned” the project is a particular course, and it is then facilitated by that classroom teacher or another adult mentor. School librarians are positioned to support students and classroom teachers as students pursue senior research projects. This may be accomplished on an individual basis, or classroom teachers may determine that small groups or entire classes of students need interventions. School librarians can collaborate with the teacher to provide interventions such as effective uses of databases, technology tools and resources, credible Web searching, bibliographic instruction, and more. In K-12 schools, Genius Hour is a movement that allows students to explore their own passions in order to capitalize on intrinsic motivation and encourage creativity. It provides students a choice in what they learn during a set period of time during school. Although I am a firm believer in designing and organizing standards-based inquiry learning such that students ARE pursuing their passions, anecdotal data suggest that “genius hour” can be a win for students and their learning. The GeniusHour.com website provides professional development, resources, videos, suggested professional reading, and more. Genius Hour is an idea adapted from Google. At one time, Google provided its engineers with “a genius hour” consisting of 20% of their work time during which they could pursue a pet project. In his book, Drive: The Surprising Truth about What Motivates Us, author Dan Pink also promotes the idea that passion projects are a way to tap into our motivation to learn and create. I appreciate Pink for this blog post, in which he describes an Innovation Day (2011) in a suburban Chicago classroom. All educators could design learning such that students experience such enthusiasm for learning every school day! Mark Dzula is the Director of Teaching and Learning Resources at The Webb Schools in Claremont, California. He is also a frequent contributor to the Knowledge Quest blog. In two recent posts, Mark described the learning experiences of students pursuing independent topics, questions, and knowledge during academic flex time. Educators create the conditions for deeper learning when they fully integrate learning and doing. “We diminish teaching and learning when we make students study history or biology or math or literature without consistently and simultaneously having them do the work of and as practitioners in the field” (Tomlinson 2018, 92). As emphasized in last week’s post, personally meaningful questions and time are two essential ingredients in empowered deeper learning. Hands-on, minds-on doing is another. What kinds of deeper learning do students in your school experience? What kinds of deeper learning do educators in your school experience? Nathan, Linda F. 2018-2019. “Hitting the Right Note.” Educational Leadership 76 (4); 62-67. Rothstein, Dan, Luz Santana, and Andrews P Minigan. 2015. “Making Questions Flow.” Educational Leadership 73 (1): 70-75. Tomlinson, Carol Ann. 2018-2019. “Sparking Students’ ‘Uncommon Genius:’ All Educators Can Learn Valuable Lessons from the Way the Arts Are Taught.” Educational Leadership 76 (4); 91-93. If schools and school systems are creating opportunities for students and educators to become stronger in knowledge, skills, and dispositions, the result will be confident, empowered students and educators who control their own learning process. Chapter 3: Inquiry Learning is, in short, about educators guiding empowered students through the inquiry process. Connecting inquiry to required outcome targets and curriculum as well as to students’ background knowledge and interests is an ideal way to help students find relevance in schooling. It is also an ideal way for students and educators to meet required learning targets and find the “sweet spot” on a Venn diagram where required learning outcomes and personally meaningful learning overlap. and so do educators. The Association for Supervision and Curriculum Development (ASCD) recently published an issue of Educational Leadership titled “When Teachers Lead Their Own Learning.” In their article “Choose Your Own Adventure: Action Research for PD,” Stephanie Dodman, Emma Zuidema, and Amy Kleiman note that “action research utilizes teachers’ own questions about their work and about student learning as they transform their classrooms (libraries) into dynamic learning laboratories” (2018, 75). The authors offer a process that includes valuing curiosity, purposefully paying attention to questions (or problems of practice), and establishing trust and motivation. Through classroom-library and team collaboration or coplanning and coteaching, educators refine their questions about practice. Two heads (or more) are definitely better than one when clarifying goals and objectives for student learning and questions for action research. With the support of administrators and colleagues, educators learn from the data they collect, analyze, and act upon as well as the reflecting on outcomes. Action research leads to empowered instruction. In Maximizing School Librarian Leadership, action research is suggested as a component of educators’ professional portfolios (page 121-122). Inquiry learning and action research are deeper learning. They are not superficial coverage of topics and materials or fly-by responses to learning challenges and problems of practice. Deeper learning, like deep reading, requires the investment of time—time to build background knowledge, time to formulate personally meaningful questions, time to pursue multiple resources and perspectives, time to collect, analyze, think critically about data, and reflect, time to organize and present new knowledge. Deeper learning simply requires t-i-m-e.
Inquiry learning and action research are ways that students and educators own their learning processes and products. These processes create empowered learners—youth and adults alike—who can apply the process to other learning experiences and transfer new knowledge to new learning situations. Deeper learning builds behaviors that are applied in lifelong learning. In what ways does your school/district’s curriculum empower learners? Does it also dis-empower them? If so, how does it do so? How do educators demonstrate that inquiry “works” as a lifelong learning strategy? Dodman, Stephanie, Emma Zuidema, and Amy Kleiman. 2018. “Choose Your Own Adventure: Action Research for PD.” Educational Leadership 76 (3): 72-76. A shared process provides a guaranteed, viable framework for student success. Students can master an information-seeking process and then adapt and expand upon it as they advance through grade levels and in various aspects of the curriculum. A common process leads to shared vocabulary and understandings that help every educator in the building communicate with and support all students in the building in achieving their learning goals. A shared process can only be realized in a positive school climate and a collaborative learning culture. A framework that promotes in-depth learning will by necessity require changes in other aspects of the learning environment. Bell schedules may need to change. Student and educator responsibilities may need to change. Assessment and evaluation may need to change. Trusting relationships, professional respect, and the ability to navigate challenges and change are essential features of such a learning community. Trust is also essential if educators support the agency of empowered students who guide their own learning process. Student-led questioning is one of the essential differences between inquiry and traditional research. When educators guide inquiry by providing students with sufficient background and helping them build connections between prior and new knowledge, they create a space in which students’ curiosity, experimentation, and creativity can thrive. Trust is also necessary in an inquiry environment that supports students as creators. Educators who give up control and share power with students in the classroom and library provide an essential piece of the inquiry learning puzzle. They support students with menus of options or give students free rein to create new knowledge in diverse and unique ways. These expressions of learning are meaningful to students and cement their ownership in both the process and products of their discoveries. Inquire is one of the shared foundations in the new AASL standards (2018). When students AND educators inquire, they practice a growth/innovator’s/inquiry mindset. They open their minds to new information, ideas, and perspectives. They use formative assessments to grow and develop as curious, creative, experimenting learners. Educators support students with timely, specific feedback to propel students forward on their learning journey, giving them encouragement to take missteps and to learn from them. The same is true for inquiring educators. They seek, give, and receive real-time feedback from one another through coteaching; they expect to be engaged as learners who are in a constant quest to improve instruction. When a school or district adopts an inquiry learning framework they are also adopting a philosophy. If you haven’t yet tuned in or want to be inspired again, please listen to Priscille Dando’s podcast interview Episode 3: Inquiry Learning, in which she shares how school librarians are leading and guiding inquiry learning to achieve district goals for students and educators. Figure 3.1 on page 38 in Maximizing School Librarian Leadership offers a “Recipe for Inquiry Learning.” It is “taken out of the book” of future ready educators and students. The ingredients are curiosity, connections, motivation, content knowledge, literacies, skills, and dispositions. The directions can be applied to any inquiry process, but all steps require sufficient time for maximum results. You can download the recipe from the ALA Editions Web Extras. Inquiry learning is student ready/future ready learning. It is the pathway to helping students develop literacies, skills, and dispositions that will serve them throughout their lives. What behaviors indicate to you that students and educators are empowered in your school? How can inquiry learning lead to empowerment for the entire school community? American Association of School Librarians. 2018. National School Library Standards for Learners, School Librarians, and School Libraries. Chicago: ALA. In addition to advocating for learning experiences that involve stimulating students’ creativity, engaging them in experimentation, and activating their creativity (see last week’s blog post), coplanning and coteaching inquiry learning are also ways to increase students’ opportunities for diverse final products. If our message to students is that all roads lead to the same outcome, many will not see the relevance of their learning experiences to their lives. They will not experience learning as a complex activity that results in diverse creative expressions of learning. Too many will disengage or simply be lost or derailed along the way. During coplanning, classroom teachers and specialists may express reservations about students taking curriculum into individual or unexpected pathways. Secondary educators, in particular, who may be responsible for learning outcomes for 75 middle school or as many as 150 high school students may shudder to think that they alone will be responsible for guiding and assessing students’ learning. School librarians who coplan, coimplement, AND coassess student learning outcomes can ease classroom teachers’ and specialists’ concerns about giving students “free rein” to explore in many different directions and in producing many different final products. Collaboration can also ensure that educators create flexible assessment tools that accurately reflect students’ achievement in terms of learning objectives as well as their creativity. Two (or more) educators working as a team can better monitor and guide individual student’s learning as well as small group work. Inquiry circles as described in the guided inquiry require check-ins from educators (Kuhlthau, Maniotes, and Caspari 2015, 32–36). It is through check-ins that educators push students’ thinking, offer resource support, identify stumbling blocks, and opportunities for reteaching specific subskills to the students who need them to move forward. One of my all-time favorite teaching memories involved working with a second-grade teacher (in the late 1990s) who structured her classroom around inquiry. Students identified areas of interest, pitched their ideas to the class, and formed small groups to pursue meaningful questions. As their school librarian, I often worked with more or more groups as they sought information through the library’s resources. One of the questions for the “frog and other amphibians” group was about dissecting frogs to learn more about their body parts and functions. I helped the group contact a biology professor at the University of Arizona. The students posed their questions to him and organized a field trip to his lab where he led them in dissecting and learning about frogs. I had the distinct pleasure of accompanying them on their adventure. Years later, two students from that group remembered that learning experience as one of the most powerful in their elementary education. Learning is complex and expressions of knowledge can (and should?) be unique. When classmates share their learning processes and final products, students (and educators) should be amazed at the divergent thinking and variety of expressions of learning. When students are given the opportunity to pursue learning that is personally meaningful, use resources they have discovered on their own, selected and employed tools that helped them meet their individual (or their group’s) goals for sharing, they are enacting the skills and dispositions of lifelong learners. Inquiry Learning = Preparation for Life! What strategies have you used for supporting students’ diverse creative expressions of their learning? Describe the assessment tools you have used to guide students’ learning while giving them opportunities to express their learning in diverse and creative ways? Kuhlthau, Carol C., Leslie K. Maniotes, and Ann K. Caspari. 2015. Guided Inquiry: Learning in the 21st Century. 2nd ed. Santa Barbara, CA: Libraries Unlimited. In their book. A Curious Mind: The Secret to a Bigger Life, Brian Grazer and Charles Fishman (2015) emphasize the importance of curiosity as a springboard to creativity and innovation. Educators who create learning environments and opportunities that stimulate students’ curiosity help them on a path to lifelong learning. For far too many students, schooling has stunted their innate curiosity. Over time, they have come to think of school as the place where the educators ask the questions, and students’ job is to respond to those questions with answers the educators already know. When students are given opportunities to revive their sense of wonder, they can take charge of their learning in ways that will support them throughout their academic, professional, civic, and personal lives. Experimentation was once reserved for science and art courses, with chemistry labs and art classes the most often offered opportunities. The STEM/STEAM/STREAM focus in recent years has added technology, robotics, and engineering to the mix. Many school librarians have turned to makerspaces as strategies for engaging students and classroom teachers in experimentation. The opportunity to risk, fall short, and learn from missteps is a foundational tenet of makerspaces. Although a makerspace may be housed in the library, hands-on, minds-on learning can be strengthened when the “maker” philosophy is diffused throughout the school. When classroom teachers, specialists, and school librarians collaborate, students have the opportunity to experiment and explore in all content areas and develop a growth/inquiry/innovator mindset. School librarians who coplan and coteach with their colleagues help spread the benefits of makerspaces in the learning community. Creativity was once associated with the fine and industrial arts more than any other areas of the curriculum. Students signed up for art, music, shop, and home economics classes with an understanding that the curriculum in those courses would allow them free rein to explore, experiment, and “fail forward.” In these courses, students and educators expected students to access and enact creativity in their thinking and in the final products they created. Creativity is one of the Partnership for 21st Century Learning’s 4Cs. When students are encouraged to imagine and “think outside the box,” they may pursue and express their questions, knowledge, and learning in unexpected ways. For some youth, personalized learning can be a pathway to unleashing students’ creativity. For others, small group exploration may be the path to connecting their own creativity with that of their peers. An effective school library program involves students and educators in exploring the curriculum, resources, information, and ideas in creative ways. School librarians can spotlight the ways students use library resources and tools to create. They can work with colleagues and administrators to ensure that curiosity, experimentation, and creativity are cornerstones of students’ learning experiences. Taking the attitude and enacting the behaviors of “explorers,” students can stretch themselves beyond their own expectations. Through codesigning and coteaching with classroom teachers and specialists, school librarian can also stretch themselves and advocate for engaging learning experiences for students. What are your school’s considerations in determining the location of a makerspace in your school building? What are the benefits to students when school librarians share responsibility for facilitating making? What are the advantages to students, educators, and school districts when leaders agree on a school-wide or district-wide research/inquiry learning process? Researcher Robert Marzano (2003) has been proclaiming the importance and effectiveness of a guaranteed, viable curriculum for many years. In that same vein, I believe a guaranteed, viable research/inquiry learning process can help students, classroom teachers, and school librarians effectively use a common vocabulary, set of procedures, and processes. It can ensure that students have multiple opportunities to practice and internalize a process and that educators have an agreed upon set of sub-skills that students need to be taught and master in order to be successful information-seekers, users, and creators. There are a number of processes that have been proposed by library and education leaders. School librarians, students, and classroom teachers have applied the Super 3, Big 6, Savvy 7, the Stripling Model, WISE model, Guided Inquiry Design or GID (Kuhlthau, Maniotes, and Caspari 2012), and more. Some of these models have focused more on a traditional research process and some are focused on an inquiry model. In Maximizing School Librarian Leadership, I have built the inquiry chapter around the GID for several reasons. The GID is based on research conducted by Carol Kuhlthau. It acknowledges learning as a social-emotional process as well as an intellectual one. The GID process is comprehensive. It activates and provides students with necessary background knowledge to develop meaningful questions for study. It integrates reflection and formative assessment throughout the process and involves students in sharing their new knowledge. It is best facilitated by teaching teams working in instructional partnerships. To my way of thinking, it is perfectly designed for classroom-library collaboration. School librarians, classroom teachers, and administrators can work in teams to review, assess, and select inquiry and research processes that will meet the needs of their learning communities. Taking a collaborative approach to determining a process that students apply in multiple grade levels and content areas is ideal. Last month, Laura B. Long posted an outstanding article on the KQ blog about her collaborative work with her principal, school improvement team, and faculty to co-create a school-wide research process: Is a School-wide Research Model for You?” In her article, Laura shares the steps she took to lead her school community in instituting and shared process. “With the school’s Research Road Map approved and ready to share, (Laura) had the opportunity to meet with all of the teachers during one of our back-to-school workdays to introduce the new model to everyone. Small posters were printed for all classrooms, and multiple posters and reminder cards were printed for the library. Additionally, the road map was added to our student and teacher resources pages on the library website” (Long 2018). I look forward to learning more about how this process will work for students and educators during this first year of implementation. School librarian supervisor Priscille Dando provided this month’s virtual interview podcast. In her interview, Priscille shars how she is leading 244 librarians serving in 193 school library programs. She tells how the librarians in her district came to adopt the GID and her role in rolling out this inquiry learning framework. Priscille also shares the responses from students, classroom teachers, librarians, and administrators and how the GID supports other initiatives in Fairfax County (VA) Public Schools. What do you see as advantages for students, educators, administrators, and families in having a guaranteed, viable research/inquiry model and do you have colleagues in your school or district who may agree? If you school does not have a school-wide or district-wide research/inquiry model what would be your process for launching this conversation? Kuhlthau, Carol C., Leslie K. Maniotes, and Ann K. Caspari. 2012. Guided Inquiry Design: A Framework for Inquiry in Your School. Santa Barbara, CA: Libraries Unlimited. Marzano, Robert J. 2003. What Works in Schools: Translating Research into Action? Alexandria, VA: Association for Supervision and Curriculum Development. “Curiosity is the tool that sparks creativity. Curiosity is the technique that gets to innovation” (Grazer and Fishman 2015, 62). Inquiry learning can spark students’ curiosity and ignite their passions. Inquiry puts learners in the driver’s seat and leads them to invest in and care about the literacies, skills, and dispositions they develop during the process. As students pursue the answers to personally meaningful questions and engage in real-world projects, they learn how to learn and build their confidence. Hands-on, minds-on inquiry learning experiences help prepare young people to problem solve when confronted with the inevitable learning that will characterize their futures. Educators are responsible for creating the conditions in which inquiry learning can flourish. Inquiry doesn’t just happen; it must be expertly designed. Building connections between required curriculum and students’ interests is essential. When two or more educators plan for inquiry, they increase the resources and knowledge at the collaboration table. They push each other’s creativity and codevelop more engaging learning experiences for students. When school librarians and classroom teachers coplan, coteach, and comonitor students’ inquiry learning process, they create opportunities for students to increase their content knowledge. They help students develop future ready skills and strategies that are transferrable to other learning contexts—both in and outside of school. This chapter provides a rationale for applying a research-based model for inquiry learning. Guided Inquiry Design (GID) is grounded in the findings of Kuhlthau’s information-seeking process research. GID provides a structure in which a team of educators share responsibility for launching, guiding, monitoring, and assessing learning outcomes. During curriculum-connected inquiry, students take responsibility for and reflect on their own learning process and products. 5. Inquiry as a Strategy for Professional Learning. School librarians can be leaders in codeveloping, coimplementing, and sustaining a culture of inquiry in their schools. When school sites or entire districts adopt and practice a single inquiry model, students can rely on multiple opportunities to experience deeper learning. When educators use an inquiry model to explore their own questions about teaching and learning, their understanding of the process and their confidence in their shared findings strengthen a culture of learning and improve teaching in their schools. This week, on September 21st, the United Nations will once again celebrate the International Day of Peace. On this day, we join together around the globe to advocate for non-violence and strengthening peace among people and nations. This year, AIC members Amy Ludwig VanDerwater and Young People’s Poet Laureate Margarita Engle initiated a Padlet project where AIC members can share writing, art, and classroom activities related to peace. I contributed a classroom-library-literacy coach-art classroom cotaught inquiry unit under the “Peaceful Activities for the Classroom” category. During the 2001-2002, I served as a literacy coach at an elementary school in Tucson Unified School District. Along with a third-grade classroom teacher, the school librarian, and the art instructor, I codesigned and cotaught an inquiry unit focused on peace: Peace Poems and Picasso Doves. We introduced this unit of study by reading Somewhere Today: A Book of Peace, Peace Begins with You written by Shelley Moore Thomas, illustrated with photographs by Eric Futran and selections from The Big Book for Peace edited by Ann Durell and Marilyn Sachs. 1. What do individuals do to find peace? 2. What do communities do to create peace? 3. What are some symbols for peace? The collaborating educators developed a text set of resources, which students explored as they began to develop their own questions, thoughts, and feelings related to peace. The students’ literature circle discussion around the book Smoky Night by Eve Bunting, illustrated by David Diaz were particularly powerful. Students studied and wrote poetry and learned about Pablo Picasso’s peace dove artwork. In their final products, the students’ peace poems and Picasso doves captured the personal meaning they ascribed to the word and concept of peace. There is an undeniable link between peace and social justice. Expanding out from the personal to peaceful communities based in social justice is a logical next step. The United Nations Convention on the Rights of the Child can help young people see the connection. With primary age students, I have used the child-friendly version and the book For Every Child: The Rights of the Child in Words and Pictures offered by the U.S. Fund for UNICEF. For older students, in particular, the possibilities for connections to historical and current events is limitless. If you have not yet read it, please see Loretta Gaffney’s Knowledge Quest blog post “Hate Has No Home Here: The Post Charlottesville School Library” (9/13/17). Loretta provides us with much to think about and excellent resources for educating for social justice. School librarians who curate resources and codesign and coteach lessons and units of instruction have an essential role to play in making connections for learning between the classroom and library and across disciplines. We also have an obligation to “make important interventions in a political climate of hatred” (Gaffney). In your daily practice of librarianship and this week, in particular, I hope you will look for ways to increase the peace and inspire conversations about social justice in your learning community. If you tweet, please use #peaceday to share your work this week. Gaffney, Loretta. “‘Hate Has No Home Here’: The Post-Charlottesville School Library.” Knowledge Quest, 13 Sept. 2017, knowledgequest.aasl.org/hate-no-home-post-charlottesville-school-library/. While authoring my forthcoming book, I have read (and re-read!) many professional books. This is the tenth in a series of professional book reviews–possible titles for your professional reading. The reviews are in no particular order. 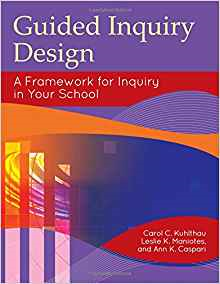 I read Carol C. Kuhlthau, Leslie K. Maniotes, and Ann K. Caspari’s book Guided Inquiry Design®: A Framework for Inquiry in Your School when it was first published in 2012. In 2012-2013, I was part of the Denton Inquiry for Lifelong Learning Project. We conducted a year-long study centered on this book. Our goal for the study was to increase the understanding and practice of inquiry learning among the various stakeholders in the Denton literacy community. Our collaborators included school librarians from Denton Independent School District, the Denton Public Library, the university libraries and graduate library schools of Texas Woman’s University and the University of North Texas. There are eight phases in the Guided Inquiry Design (GID) Process: open, immerse, explore, identify, gather, create, share, and evaluate (2). Reflection and assessment are embedded throughout the process as a way for students and educators to monitor learning and ensure success. The GID is intended to be co-facilitated by an inquiry team that includes two or more educators, including a classroom teacher or specialist and the school librarian. Throughout the phases, educators have shared responsibilities for designing learning experiences and collaborating with students to make school-based learning authentic, personally meaningful, and relevant to students’ lives. Educators also share responsibility for monitoring student progress and assessing student learning outcomes. In co-facilitating inquiry learning, educators can practice and students can experience the creativity that comes from “two (or more) heads are better than one.” In addition to integrating the rich resources of the school library into inquiry learning, educators have expanded opportunities to launch the open phase creatively. With two or more educators facilitating student engagement with resources and identifying questions, students and inquiry groups will receive more personalized feedback throughout the process. With two or more educators monitoring student learning and providing interventions as needed, student success will be more assured. Educators will also benefit personally by lowering the stress of guiding “messy” inquiry learning. They will practice reciprocal mentorship throughout the process and have the opportunity to improve their own teaching practices. They will have someone to share the joys and challenges and celebrate students’ success. The GID clearly aligns with privileging the instructional partner role of the school librarian, my raison d’être! How does inquiry learning align with your state standards? Although the term “research” rather than “inquiry” is used, one benefit Texas educators have is that the English Language Arts and Reading standards specifically include learning standards that align well with the phases of the GID. These include students developing open-ended questions, a “research plan,” revising research questions, applying information literacy skills (authority, reliability, validity, bias), resolving discrepancies in information, presenting their learning, and more. When classroom teachers and school librarians coplan and coteach inquiry learning, educators can seamlessly and authentically integrate content-area, digital, and information literacies, competencies such as the Partnership for 21st Century Learning’s 4Cs (communication, collaboration, creativity, and critical thinking), and dispositions, such as persistence and flexibility, into students’ learning experiences. If you do not yet guide inquiry learning in your school, please read this book. Check out the model lesson plans offered at the end of each chapter focused on each phase of the GID. If you have been teaching another inquiry or research process, compare it to the GID. I believe you will find that the GID offers you, your colleagues, and your students with a framework for guiding future-ready learning in your school. Kuhlthau, Carol C., Leslie K. Maniotes, and Ann K. Caspari. Guided Inquiry: Learning in the 21st Century. 2nd ed. Santa Barbara, CA: Libraries Unlimited, 2015.